After accepting the license agreement and providing identity information as needed, DeployMaster will install the package. During the installation, several progress meters will show that the installation is proceeding. However, if the setup is only a couple of megabytes in size, installation will happen so fast that the "Thank You" screen will show up almost immediately. If certain files which were in use by the system during the installation need to be updated then DeployMaster will inform the user that the system should be rebooted. Otherwise, it will just say "Thanks". 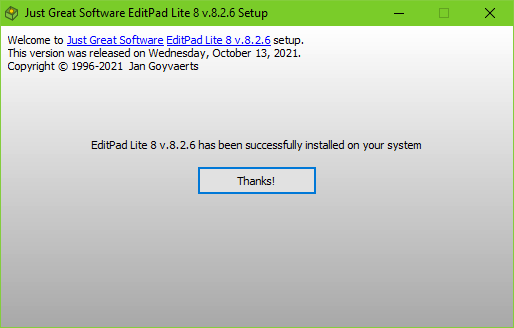 Clicking the Thanks button will show the Start Menu folder and/or launch the installed application if configured on the Finished page and then close the installer. The user can skip the finishing step by closing the installer by clicking the X button in the caption bar.